I received a wonderful package with three books from the Lark Books' Stash Happy series! 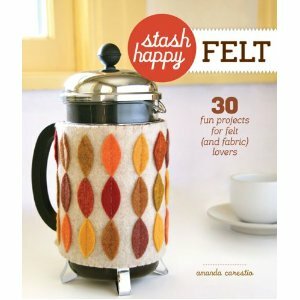 These are fun, happy books that encourage you to make stuff immediately. If you have any kind of fabric stash at all (and who doesn't? ), you'll be able to make most of the quick and clever projects featured with no run to the fabric store needed. 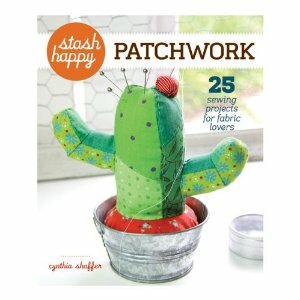 If, like me, you are a collector of tiny scraps, you'll be amply rewarded by these three books, two by Cynthia Shaffer: Stash Happy Applique, Stash Happy Patchwork; and one by Amanda Carestio: Stash Happy Felt. These books contain all you need except for the scraps: beautiful photography, easy to follow instructions, templates for Cynthia's original projects, and tips. If you like scrap crafts, recycling, reusing, and general cuteness, you're gonna love these books! And now I've got a chance for you to win them...one at a time! 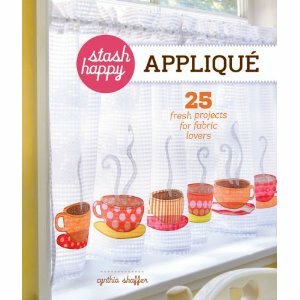 I'm going to start with Stash Happy Applique! If you'd like to win a copy, just leave me a comment below and you'll automatically be entered to win. If you tweet or post on Facebook or other social spots about the contest, you can leave a second comment and be entered twice! You got to love Lark Books and also your blog! This looks like a fun book. Thanks for the giveaway. That book looks like it's right up my alley! OMGosh - something to do with my stash of fabric scraps! Please count me in. Me again ... I pinned and tweeted. Hi, I also want a chance to learn more, please? I would love to win this book - thanks for the chance! Lark puts out some really great books. Of course, please enter my name since I would love a chance to win.